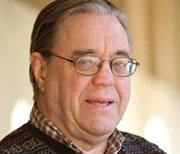 David J. Stevenson (2015-2021)—The Marvin L. Goldberger Professor of Planetary Science at the California Institute of Technology, is a world-class scientist, renowned for his creative ideas and contributions of original research in a broad span of areas centering on planetary science but extending as well to geophysics and astrophysics. Professor Stevenson has conducted pioneering work in Earth Science (such as the nature of the Earth’s core, mantle convection, and the generation of magnetic fields), planetary science (the interiors of planets, the origin and evolution of icy satellites, and the origin of the Moon), and astrophysics (behavior of degenerate matter and ohmic heating of extra-solar planets, among other problems). Stevenson’s curiosity-driven approach to problem solving has led him from classical questions in geophysics to more novel ones such as whether free-floating planets might be habitable, and how one might sample directly the core of the Earth. In addition to being a gifted researcher, he is a highly respected and inspiring teacher as evidenced by being awarded the Richard P. Feynman Prize for excellence in teaching, California Institute of Technology’s highest honor for teaching. He has a passion for sharing his scientific research, and his remarkably lucid explanations of how physical processes work that grace all his talks from public lectures to classes, to technical scientific presentations. David Stevenson has been recognized by many major academic awards and honors, including election as a Fellow of the Royal Society and a Foreign Associate of the National Academy of Sciences. Professor Stevenson is widely published in astronomy and planetary science. His work has inspired widespread media interest, for example when two of his papers in Nature (a proposed mission to the Earth’s core and the development of life on planets that freely roam the galaxy) were discussed on The Daily Show and The Tonight Show. Born in New Zealand, where his did his undergraduate work, Stevenson obtained his Ph.D. at Cornell University in 1976, under famed astrophysicist Edwin Salpeter, developing the standard model for the behavior of hydrogen and helium in giant planets. He also worked with Prof. Neil Ashcroft in the Physics department, where his work focused on the high-pressure properties of hydrogen. See all in Physical Sciences, Professors-at-Large category.